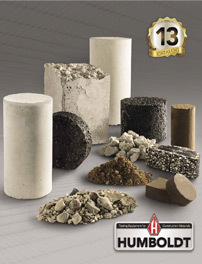 Asphalt testing equipment for road construction, mix evaluations and SHRP testing Humboldt provides a complete selection of asphalt testing equipment for asphalt mix evaluations of both Marshall and SHRP/Superpave mixes in accordance with ASTM, AASHTO and other standards. This includes: asphalt mixture testing; bitumen viscosity; rice test specific gravity and all the components of a SHRP testing regimen. From ductility machines and penetrometers to Marshall load frames and Hamburg wheel-tracking devices, you'll find the asphalt testing equipment you are searching for, here on the Humboldt website.